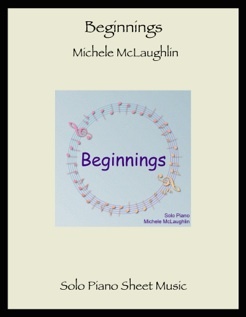 Beginnings is the companion sheet music collection for Michele McLaughlin’s 2000 debut CD by the same name. The CD has remixes of “Tommy’s New Toy” and “Russian Music Box” that are not included (the solo versions are), making a total of eighteen songs. 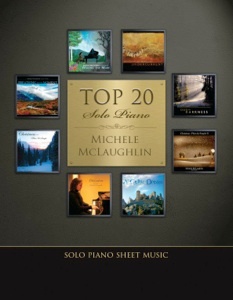 Several of these pieces are quite easy, and most are only two pages (plus repeats), so intermediate-level pianists should have no problem with most of these songs. Three of the pieces are in Gb major or Eb minor (six flats in the key signatures), but as long as you can remember to flat the Cs, the actual playing of those pieces is not difficult. These are note-for-note transcriptions expertly done by John Zechiel and David Shenton, with clear notation and uncluttered spacing. There are a few passages with octaves, but chords are fairly rare and there are no reaches beyond the span of an octave. 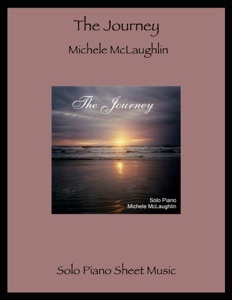 The ease of playing these pieces should bring many hours of enjoyment, as the melodies are very accessible and the music is fun to play. 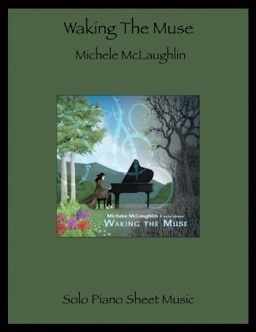 My own favorites are “Russian Music Box,” “Scattered Showers,” and “All Alone.” All of Michele’s sheet music and songbooks are available on michelemclaughlin.com.